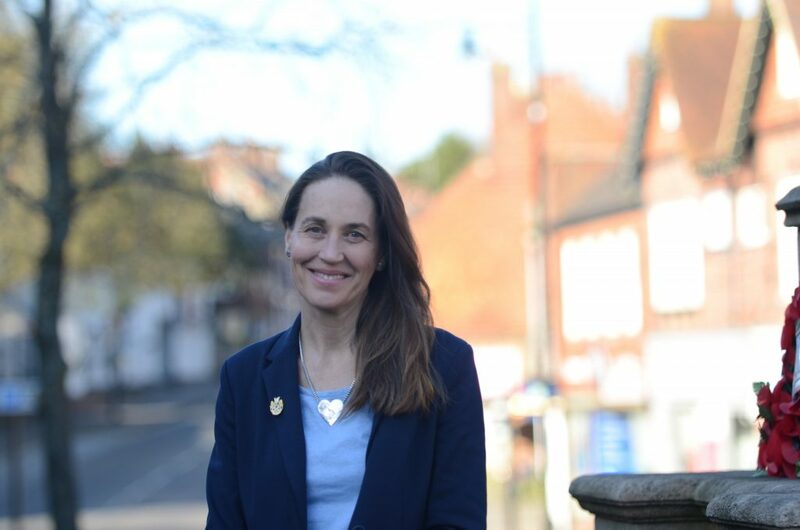 I have uploaded my candidate profile for Surrey County Council’s by-election for Haslemere on 2nd May 2019 on the Democracy Club website. Surrey County Council is responsible for so much that affects our daily lives – social care, health, highways, schools & learning, libraries, waste and recycling. Budgets are being slashed. Key services are under threat. Haslemere needs a councillor to show up and champion our town. When I was County Councillor (2013 – 2017), I threw myself into the role with energy, and a deep commitment to serve the community with passion, transparency and engagement. I worked hard, listened and built trust. 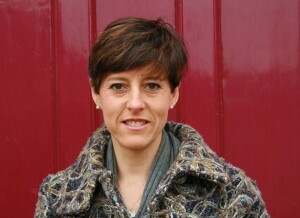 Here are some of my achievements: www.haslemerefirst.com/achievements. By submitting your postcode, you can view biographies of all candidates for this by-election. This entry was posted in Election and tagged By-Election, Haslemere first, Surrey County Council, VoteIndy on April 15, 2019 by admin. Maria and Nikki here. We enjoyed campaigning in the High Street this morning with supporters. We had a mixed range of comments about being independent candidates and standing for the town council. Ziggy can’t vote. Here’s Ziggy supporting Maria and Nikki with a white rosette. I’ll be supporting those independents – it’s just not healthy to have all that party politics in a town council. I like the sound of those two – pity I didn’t register to vote, I will for next time. I have voted already by post. You both got my vote. I’m crossing my fingers to hope they do get elected. We need them on the town council. I’m in Shottermill but I would vote for those independents if I could. I live in Courts Hill Road and I love the new lighting in Sandrock that I read about in your leaflet. So my wife and I voted for you. There should not be party politics at local level. We’ll be out campaigning again tomorrow and we look forward to meeting more voters. Haslemere South Ward in the town council election. This entry was posted in Election and tagged By-Election, Haslemere Town Council, Maria Mateo, Nikki Barton on June 3, 2017 by admin. 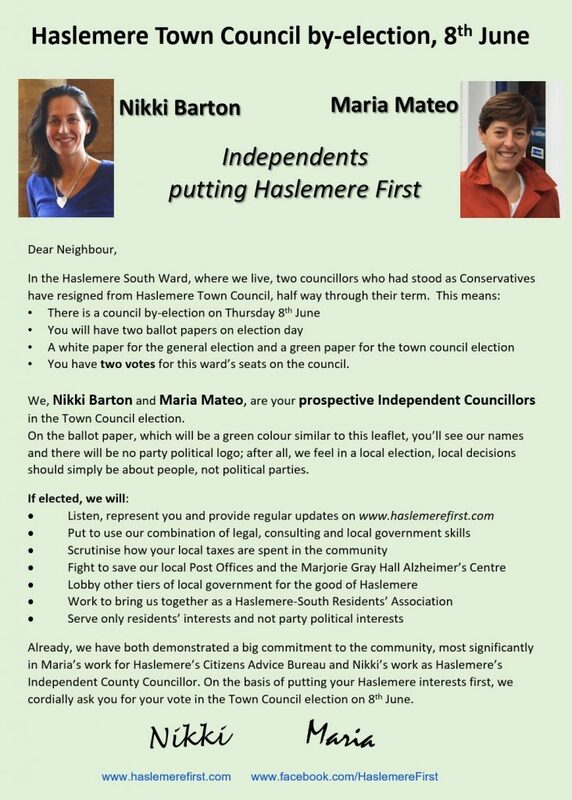 Message from Maria Mateo and Nikki Barton: We began delivering our Haslemere Town Council campaign leaflets on Saturday and then stopped campaigning due to the Manchester attack. Today, we resumed campaigning with a team of great volunteers in Haslemere South sharing the work by helping us deliver our campaign leaflets. This entry was posted in Election and tagged Haslemere Town Council, Independent, Maria Mateo, Nikki Barton on May 25, 2017 by admin. 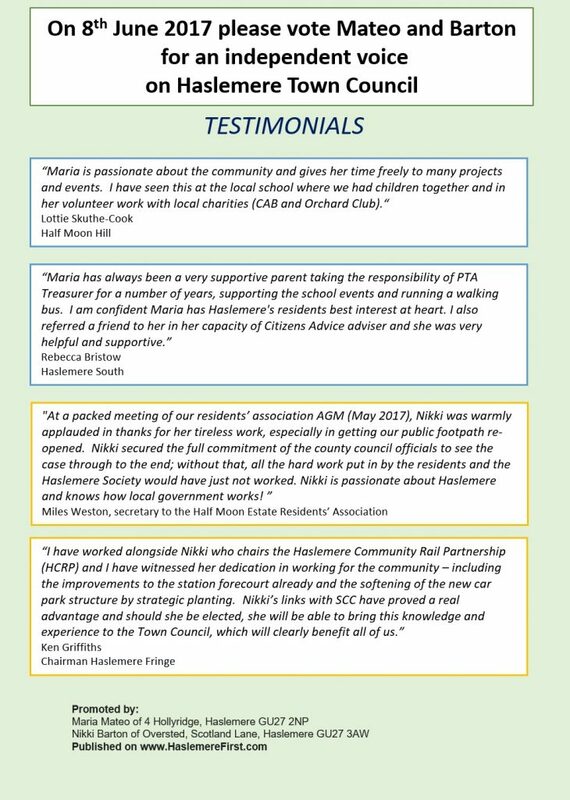 In March 2017, the local press reported that three elected councillors – half way through their term – have resigned from Haslemere Town Council. This has caused by-elections to fill these councillor vacancies including one by-election in the Haslemere South Ward (2 vacancies) where Maria Mateo and Nikki Barton live. Mateo and Barton are your Independent candidates for this by-election. The by-election will be on Thursday 8th June. As you are aware, this is the same day as the general election. You will have two ballot papers on this day at The Georgian House Hotel polling station. One will be to vote in the general election for an MP (one ballot paper, one vote). The other ballot paper will be to vote in the Town Council by-election for two new town councillors (one ballot paper, two votes for two councillors). 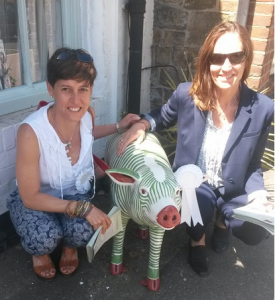 On the ballot paper, which will be a green colour, you’ll see our names – MARIA MATEO & NIKKI BARTON – and there will be no party political logo; after all, we feel in a local election, local decisions should simply be about people, not political parties. I care about Haslemere. My family have lived here for over ten years. I am actively involved in our wonderful community. I have worked as a solicitor and local adviser with Citizens Advice and now training as a Waverley Supervisor with this charity. 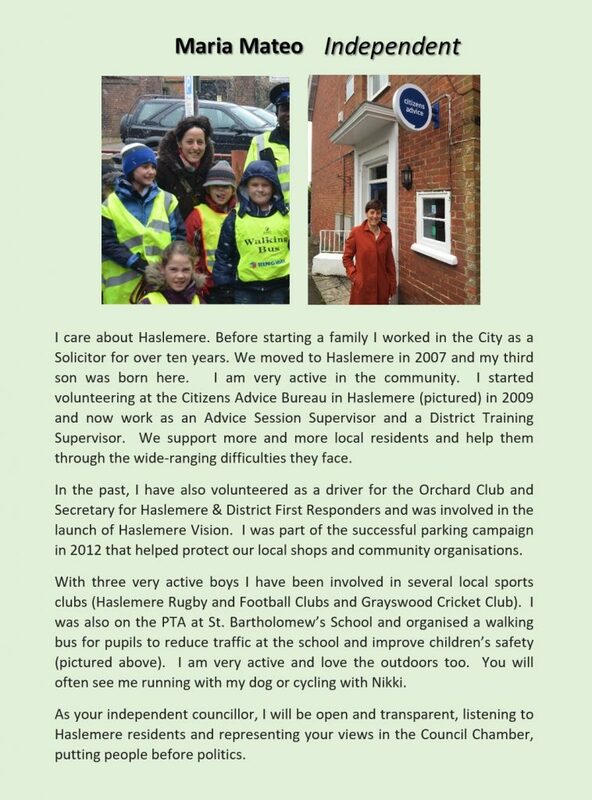 I’m a volunteer and have given many hours to several community groups (Haslemere First Respondents, Orchard Club, and Haslemere Rugby and Football Clubs). I organised a local school’s walking bus. As your independent councillor, I will be open and transparent, listening to Haslemere residents and representing your views in the Council Chamber. With experience as your County Councillor, I have a proven track record in putting Haslemere first. 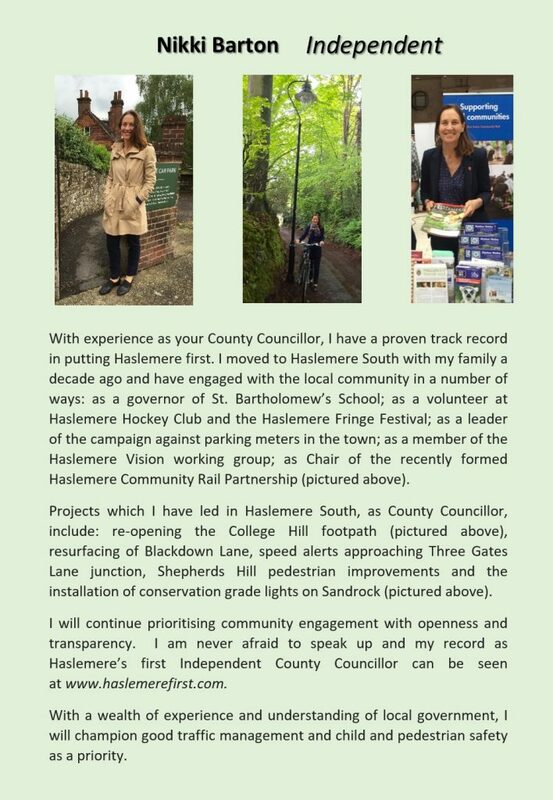 I moved to Haslemere South with my family a decade ago and have engaged with the local community through: school governorship; Haslemere Hockey Club; Fringe Festival; Haslemere Vision; Chair – Haslemere Community Rail Partnership. I will continue prioritising community engagement with openness and transparency. Never afraid to speak up and my record as Haslemere’s first Independent SCC can be seen via the pages of this blog. With a wealth of experience and understanding of local government, I will champion good traffic management and child/pedestrian safety as a priority. 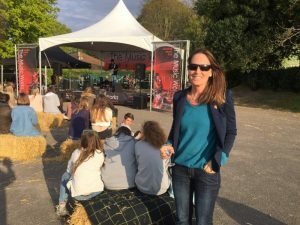 This entry was posted in Election and tagged By-Election, Haslemere, Haslemere Town Council, Independent, Maria Mateo, Nikki Barton on May 18, 2017 by admin. Up and down the land there are more than 1,700 independent councillors representing 7.5m people in 39 councils. On 7th May there is a unique opportunity to elect twelve independent councillors to represent you on Haslemere Town Council and Waverley Borough Council. If elected, we will be answerable not to a political party but to our constituents and our consciences. We commit to core principles of openness, transparency and accountability. This entry was posted in Election, Haslemere first and tagged 7 May 2015, elect12indies, Haslemere Town Council, Waverley Borough Council on May 1, 2015 by admin. 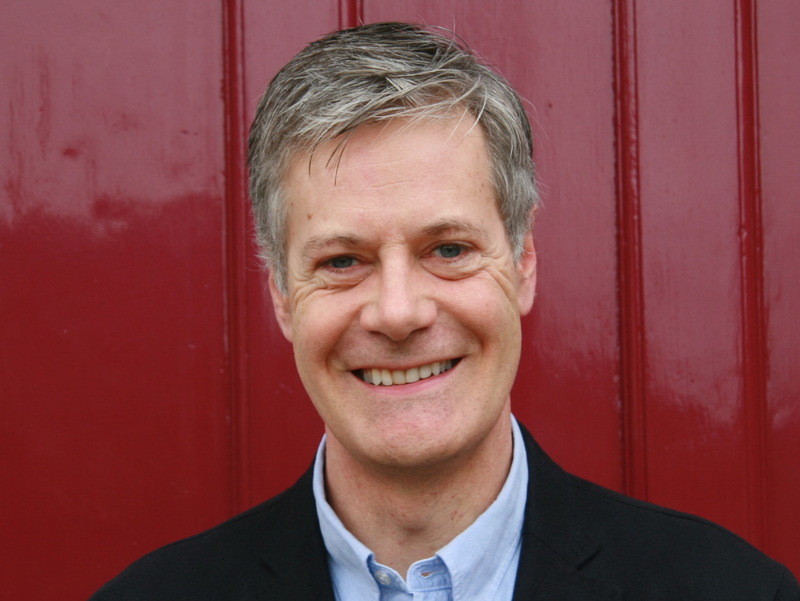 Should there be an SNP candidate for Haslemere’s Town Council? Of course not! There is no logic for a candidate to bring national politics to our parish council, HTC. From recent correspondence in your paper, it seems everyone agrees on this. So what possible reason is there for any prospective town councillor to be affiliated to any political party in the context of this parish council election? Perhaps the logic is to align with a party’s policy or with a controlling party’s decisions at Waverley or Surrey cabinet levels. If so, why bother with a town council at all? Why not simply manage all town matters from the County or Borough executive offices? Perhaps the thinking is to appeal to “people like us”. As a Haslemere resident, I shall be voting for a candidate in the General Election who is affiliated to a national party, but I definitely wouldn’t dare to presume that fellow residents of Haslemere who vote differently from me in that election are not just as committed to Halsemere and its best interests as I am. It is a nonsense to equate fervour for a particular party with fervour for Haslemere, or to claim party allegiance alongside free representation on Haslemere’s parish/town council. To argue otherwise is simply… well, it’s simply perpetuating party politics in our parish and town! I am affiliated to Haslemere. That is the only affiliation or allegiance I believe is right, on Haslemere Town Council. Being independent, in this context, means freedom from any manifesto, dictat or “messaging” from party office – or from whichever majority party prevails at either County Hall or Borough Offices; it means not feeling obliged to be consistent with policy announced by my local Member of Parliament or the Leader of County Council; and it means deciding relevant town matters in Town Council meetings and committees, and nowhere else. I commit, if elected, to listen to, and represent, the people of Haslemere in an open, transparent and independent-minded way, serving the furtherance of our precious town’s best interests. This entry was posted in Election and tagged Haslemere South Ward, Haslemere Town Council Election, Jeremy Barton on April 17, 2015 by admin.